The Emily Dickinson Lexicon is a dictionary of alphabetized headword entries for all of the words in Emily Dickinson’s collected poems (Johnson 1955 and Franklin 1998 editions). The scope of the Dickinson lexicon is comprehensive. A team of lexicographers and reviewers has examined almost 100,000 individual word occurrences to create approximately 9,275 headword entries. The EDL includes proper nouns, person names, and place names that are not usually listed in general dictionaries of the English language. Because high-frequency function words such as a , of , and the are important for Dickinson studies, the EDL includes basic definitions for 168 words that were omitted from Rosenbaum's concordance (xi) with their 38,235 occurrences. Words from Dickinson’s collected letters are not included in the EDL at this time. Visitors and users can view the EDL by clicking on the lexicon tab in the top frame of the website. To see multiple alphabetical entries, click on a letter of the alphabet or on a page number as serialized below the running headers for each EDL page. To access a specific entry, type a Dickinson word in the basic white “Searches” box provided in the upper right hand corner of the layout. Registered users have access to additional search options, by clicking on the phrase "Searches." adore (-d, -ing, -s), v. [Fr. < L. ‘speak, entreat, mouth’; NW says: “in order to kiss one’s hand, the hand is carried to one’s mouth.”] (webplay: divine, glorify, God, hand, high esteem, love, practice, worship). Headwords are derived from the alphabetical listing in Rosenbaum’s concordance. The headwords appear in lower-case bold letters, as in the word adore (-d, -ing, -s) in the entry above. Inflected forms such as the past tense morpheme (-d or -ed), the present participle (-ing), and the third person present tense (-s) appear in parentheses after the headword if Dickinson used them in her poems. Traditional parts of speech appear as abbreviations immediately after the headword, such as the form ‘v.’ for ‘verb’ in the entry for adore above. The part of speech expresses the grammatical function or lexical category of headwords. The word answer can be either a noun or a verb in Dickinson’s poems, so these appear as separate headwords in the EDL. Each derivational form of a word is treated as a separate entry, as in assemble the verb and assembly the noun. The etymologies in square brackets have two functions: to show the language origin of the headword, and to give glosses of basic root meanings. Most of the EDL etymologies are adapted from the OED. However, we do include etymological insights from Webster’s 1844 dictionary where applicable. For example, the sense of kissing a person’s hand in Webster’s etymology of ADORE adds reverence to the relationship between the “Lady” and her “little Bird” in Poem J941/Fr925. Webplay collocations appear in parentheses after the EDL etymology. Using an electronic WordCruncher concordance program, we have systematically documented lexical ties between sets of words in Dickinson’s poems and corresponding entries in Webster’s 1844 dictionary. For example, Dickinson uses the words worship , Glory , and adore in Poem J694/Fr717, and Webster uses similar terms in his definitions of adore. alphabet, n. [L. < Gk alpha + beta.] (webplay: book, learner). Simplest sounds of language; [fig.] key to knowledge; first teachings; fundamental roots; basic principles; primary elements; introductory Bible stories. Each definition is illustrated by a brief excerpt from a Dickinson poem containing that particular sense of the headword. The citation consists of the Johnson/Franklin poem numbers, followed by a quotation of the word in context. Registered users may change the poem number order to Franklin/Johnson by clicking on the Edit Profile option under the Profile tab. We try to include a main clause in each citation. If syntactic inversion or poetic ellipsis prevents illustrating the sense with a full clause, we have used punctuation dots (...) to make the thought as complete as possible. Dickinson’s word choice variants appear as headwords or in citations when they are the only example available for a specific sense. Such variant forms are marked with brackets within the citation and with a letter v next to the poem number. Dickinson’s line-end dashes are deleted at the end of citations to prevent orphaned dashes in the word-processing format. The electronic format of the EDL website facilitates the inclusion of a reference list below most of the headword entries. The reference list gives the headword and many of its morphological variations as they appear in the Johnson edition of Dickinson's poems. The reference list may include some homographic forms that are not related to the headword. Words unique to the Franklin edition will not have a reference list. The purpose of the Emily Dickinson Lexicon is to provide a reference tool for examining the lexical intricacies of Dickinson’s poems, to supply definitions for translating the poems from English to other languages, and to provide information from Webster’s 1844 dictionary that Dickinson herself may have drawn upon. The Emily Dickinson Lexicon will acquaint readers with biographical, historical, cultural, and linguistic aspects of Dickinson’s work. It will be a complement to reference works available now in Dickinson studies. Entries in the Lexicon will document the richness of Dickinson’s language for general and professional readers. The Lexicon will be especially valuable to translators who have learned English as an additional language. The EDL will help translators preserve the semantic richness of Dickinson in their target languages. Previous translations will be enhanced, and new translations will appear in more languages. Publications of selected poems can be expanded into editions of the complete poems. In 1988, upon discovering the synonymy of “Dove” and “Columba” in Dickinson’s Poem J48/Fr65, I began a serious study of Dickinson’s words, using the Oxford English Dictionary and the 1985 American Heritage Dictionary of Indo-European Roots . Karen Dandurand's Dickinson bibliography cited Richard Benvenuto's 1983 ESQ article on "Dickinson’s Use of the Dictionary," which called for further research on Dickinson and Webster connections. I wrote to Dr. Benvenuto at Michigan State University to see if he or others had continued or completed the research. The English Department chair was sad to inform me that Professor Benvenuto died of a brain tumor in 1987, at only 49 years of age. Dr. Benvenuto's article inspired my 1991 doctoral dissertation on Philology as Rhetoric in Emily Dickinson’s Poems . As my dissertation research progressed, it became very clear that a lexical approach to Dickinson’s poems unlocks the power and meaning of her language. It also became clear that Dickinson readers could benefit from a lexicon tool similar to Alexander Schmidt’s 1971 Shakespeare Lexicon and Quotation Dictionary , so I completed my dissertation as a foundation for the lexicon project. In August 1991, I began working on the lexicon project as a professor in the College of Humanities at Brigham Young University. I invited over thirty Dickinson scholars to participate in the project and received much encouragement. I also invited students in my classes to participate as apprentice lexicographers for the EDL, trying to follow the example of Dr. Calvert Watkins, who mentored Harvard graduate students as contributors to the appendix of Indo-European roots for the American Heritage Dictionary . I also kept in mind the many volunteers who contributed to the Oxford English Dictionary . I received department support, college funding, and a university Mentoring Environment Grant for the EDL lexicon project. I also applied for external funding, and in Fall 2007 the EDL website received the Albert J. Colton Fellowship for Projects of National or International Scope from the Utah Humanities Council. Having read the biographies of Johnson, Webster, and Murray, I knew that lexicographers and their sponsors tend to optimistically underestimate the time it takes to complete a quality dictionary project. I had likewise hoped to finish the EDL sooner rather than later, but as the project progressed, I adjusted the timeline to allow for technology developments, a stylistic analysis, the Franklin edition of the poems, a syntactic analysis, and other exigencies. I also wanted as many people as possible to immerse themselves in Dickinson's language and the art of lexicography. I thank all of the EDL contributors and sponsors for their patience and faith. Fifteen students spontaneously volunteered to work on the EDL after hearing about the project in History of the English Language classes during the 1992-1993 school year at Brigham Young University. Since that time, more than 400 students have contributed to the project as apprentice lexicographers, most as undergraduate volunteers, but some as paid research assistants, both graduate and undergraduate. The apprenticeships included analysis in etymology, grammar, morphology, poetics, pragmatics, semantics, stylistics, and syntax. Students gained hands-on experience in applied linguistics as they dealt with allusion, ambiguity, definition, ellipsis, metaphor, onomastics, reference, synonymy, figurative language, idiomatic expressions, word order variations, and part-of-speech shifts in Dickinson’s poems. Students acquired and more often provided computer expertise in dictionary, concordance, and word-processing programs. Thanks are due to all of the students who became EDL lexicographers. The Emily Dickinson Lexicon also owes thanks to several scholars who have served as advocates, critics, donors, reviewers, writers, and advisory board members for the dictionary. Deep appreciation is due to members and officers of the Emily Dickinson International Society (EDIS, Emily Dickinson International Society) and the Dictionary Society of North America (DSNA, Dictionary Society of North America) for presentation and publication opportunities. Several EDL scholar contributors merit special mention: Paul Black (creator of the 1995 emweb listserv); Jack Capps (author of Emily Dickinson’s Reading ); James Fraser (EDIS and EDL donor); Margaret Freeman (EDIS founder); Cristanne Miller (reviewer of an early EDL book proposal for Greenwood Press); Dorothy Huff Oberhaus (EDL advisory board member); Georgiana Strickland (EDIS Bulletin editor); Hiroko Uno (EDL contributor and international advisor); Mel Thorne (who suggested the EDL website edition); Monte Shelley and James S. Rosenvall (co-creators of the WordCruncher concordance tool); as well as many others. I am indebted to Dr. Richard Benvenuto for inspiring my doctoral dissertation on Philology as Rhetoric in Emily Dickinson’s Poems . The EDL website has received the Albert J. Colton Fellowship for Projects of National or International Scope from the Utah Humanities Council. Gratitude for institutional support is due to Brigham Young University, including the English Department, the Department of Linguistics & English Language, the College of Humanities, the Humanities Publication Center, the Honors Program, the Harold B. Lee Library, the Office of Copyright Licensing, the Kennedy Center for International Studies, and the Office for Research and Creative Activity. In addition, the EDL project is grateful to Harvard University Press for granting permission to use poem numbers and brief citations from the Johnson and Franklin editions of Emily Dickinson’s collected poems and letters. 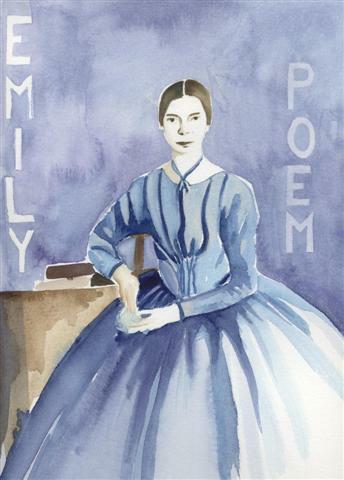 In 1999, former student Sidney Parent commissioned the "Emily Poem" watercolor by H.L. (Hanna Lindberg) that appears as the visual logo for the EDL website. In 2001, former student Jennifer Shakespear Compton created a preliminary EDL website to fulfill an assignment for a course in Computing in the Humanities. Finally, we acknowledge the providential role of web designer Russell Ahlstrom in the creation of this online edition of the Emily Dickinson Lexicon. The EDL would not have been possible without the people who introduced me to languages, linguistics, literature, poetry, rhetoric, and translation. The EDL is dedicated to those professors, mentors, teachers, relatives, and friends, especially to my honorary father Arthur Henry King, who taught me the words for my calling: lexicography and philology. The guiding principle of the lexicon is description rather than prescription. The lexicon team strives to reveal rather than suppress the semantic potential of Dickinson’s words and idioms. Team members work towards clear, complete, and accurate entries without deliberately favoring or excluding any particular interpretation or critical stance. The EDL is designed to be a complement to primary texts and secondary sources now available in Dickinson scholarship. We rely on Dickinson’s own usage in the context of the poems as the primary authority for defining her words. In addition to the corpus of poems, we have used S.P. Rosenbaum’s 1964 Concordance to the Poems of Emily Dickinson (CPED) to create a master list of collated headword entries for the words in Dickinson’s poems. The CPED alphabetically indexes the majority of unique word-forms contained in the 1955 Johnson edition of Dickinson’s 1,775 poems, including variant words that Dickinson used in different drafts of a particular poem. The lexicon team also consults the Oxford English Dictionary (OED) in preparing entries. Jack Capps’ book on Emily Dickinson’s Reading , articles in the Emily Dickinson Journal , and other scholarly works help us trace literary and historical allusions in the poems. An electronic WordCruncher concordance database enables us to track Dickinson word forms, Webster collocations, and Biblical allusions. After peer review by scholars and users in the electronic website, the Emily Dickinson Lexicon will be submitted for publication as a hardcover reference book. For further reading on Emily Dickinson's philology, please see the EDL reference list below and under the Resources tab above. The American Heritage Dictionary. Boston: Houghton Mifflin, 1983, 2003. The American Heritage Dictionary of Indo-European Roots. Ed. Calvert Watkins. Boston: Houghton Mifflin, 1985, 2000. Anderson, Charles. Emily Dickinson's Poetry: Stairway of Surprise. New York: Holt, Rinehart and Winston, 1960. _____"The Conscious Self in Emily Dickinson's Poetry" (1959). On Dickinson: The Best from `American Literature'. Ed. Edwin H. Cady and Louis J. Budd. Durham and London: Duke University Press, 1990. 33-51. Baugh, Albert C. and Thomas Cable. A History of the English Language. Englewood Cliffs, New Jersey: Prentice-Hall, 1978, 2002. Becker, Alton L. "On Emerson On Language." Analyzing Discourse: Text and Talk. Ed. Deborah Tannen. Washington, D.C.: Georgetown University Press, 1982. 1-11. _____"Biography of a Sentence: A Burmese Proverb." Text, Play, and Story. Ed. Edward M. Bruner. The American Ethnological Society, 1984. 135-55. Becker, A(lton). L., ed. Writing on the Tongue. University of Michigan, 1989. Benvenuto, Richard. "Words Within Words: Dickinson's Use of the Dictionary." ESQ 29 (1983): 46-55. Berlin, James A. Writing Instruction in Nineteenth-Century American Colleges. Carbondale and Edwardsville: Southern Illinois University Press, 1984. Bianchi, Martha Dickinson. Emily Dickinson Face to Face: Unpublished Letter with Notes and Reminiscences. Boston: Houghton Mifflin, 1932. Browning, Elizabeth Barrett. Aurora Leigh (1857). New York: James Miller, 1877. Buckingham, Willis J. "Emily Dickinson's Dictionary." Harvard Library Bulletin 25 (1977): 489-92. Burkett, Eva Mae. American Dictionaries of the English Language Before 1861. Metuchen, New Jersey: The Scarecrow Press, 1979. Cameron, Sharon. Lyric Time: Dickinson and the Limits of Genre. Baltimore: John Hopkins University Press, 1979. Capps, Jack L. Emily Dickinson's Reading: 1836-1886. Cambridge, Massachusetts: Harvard University Press, 1966. Chase, Richard. Emily Dickinson. New York: William Sloane Associates, 1951. The Compact Edition of the Oxford English Dictionary. Oxford University Press, 1971. Dandurand, Karen. Dickinson Scholarship: An Annotated Bibliography 1969-1985. New York: Garland, 1988. Dickie, Margaret. "The Cantos: Slow Reading." ELH 51:4 (Winter 1984): 819-35. _____"Reperiodization: The Example of Emily Dickinson." College English 52:4 (April 1990): 397-409. Dickinson, Emily. The Poems of Emily Dickinson. 3 vols. Ed. Ralph W. Franklin. Cambridge, Massachusetts: Belknap-Harvard University Press, 1998. _____The Poems of Emily Dickinson: Reader’s Edition. Ed. Ralph W. Franklin. Cambridge, Massachusetts: Belknap-Harvard University Press, 1999. _____The Poems of Emily Dickinson. 3 vols. Ed. Thomas H. Johnson. Cambridge: Belknap-Harvard University Press, 1955. _____The Letters of Emily Dickinson. 3 vols. Ed. Thomas H. Johnson. Cambridge, Massachusetts: Belknap Press, 1958. _____The Complete Poems of Emily Dickinson. Ed. Thomas H. Johnson. Boston: Little, 1960. _____Emily Dickinson's Selected Letters. Ed. Thomas H. Johnson. Cambridge: Belknap-Harvard University Press, 1971. Diehl, Joanne Feit. Dickinson and the Romantic Imagination. Princeton: Princeton University Press, 1981. Doroszewski, Witold. Elements of Lexicology and Semiotics. Paris: Mouton, 1973. Dyche, Thomas and William Pardon. A New General English Dictionary 1740. New York: Georg Olms Verlag, 1972. Emerson, Ralph Waldo. Selections from Ralph Waldo Emerson. Ed. Stephen E. Whicher. Boston: Houghton Mifflin, 1957. Fast, Robin Riley and Christine Mack Gordon. Approaches to Teaching Dickinson's Poetry. New York: MLA, 1989. Feidelson, Charles. Symbolism and American Literature. Chicago: University of Chicago Press, 1953. Ford, Emily Ellsworth Fowler. Notes on the Life of Noah Webster. 2 vols. Ed. Emily Ellsworth Fowler Skeel. New York: Private printing, 1912. Fowler, William C. English Grammar: the English Language in Its Elements and Forms. New York: Harper and Bros, 1850. Frederickson, Coralee Anne. Emily Dickinson: A Word Made Flesh. Dissertation Abstracts International 41/01A, p. 249, State University of New York, 1980. Friend, Joseph Harold. The Development of American Lexicography 1798-1864. Paris: Mouton, 1967. Genung, John F. The Practical Elements of Rhetoric (1885). Boston: Ginn, 1893. Gura, Philip. The Wisdom of Words: Language, Theology, and Literature in the New England Renaissance. Middletown, Connecticut: Wesleyan University Press, 1981. Hallen, Cynthia L. “At Home in Language: Emily Dickinson’s Rhetorical Figures: Proceedings of the Third International Conference of the EDIS.” Emily Dickinson at Home. Eds. Gudrun M. Grabher and Martina Antretter. Innsbruck, Austria: Wissenschaftlicher Verlag Trier, 2001, 201-222. _____"Brave Columbus, Brave Columba: Emily Dickinson's Search for Land." Emily Dickinson Journal 5:2 (1996) 169-75. _____"Student Lexicographers: Pioneers for the Emily Dickinson Lexicon." Dictionaries 15 (1994) 100-115. _____"Lexical Music in Emily Dickinson's Poems." Dickinson Studies (first half 1992): 24-39. _____"Emily Dickinson and Noah's Ark." DLLS Proceedings (Fall 1992): 69-79. _____"Lexicography as Cohesion and Metaphor in the Poems of Emily Dickinson." Work in Progress 2 (Fall and Spring, 1990-91): 130-38. Hallen, Cynthia L. and Laura M. Harvey. "Translation and the Emily Dickinson Lexicon." Emily Dickinson Journal 2:2 (1993): 130-146. Hallen, Cynthia L. and Malina M. Nielson. “Emily Dickinson’s Place Names.” Names: A Journal of Onomastics. 54:1 (March 2006) 5-21. Hallen, Cynthia L. and Jennifer Shakespear. "The T-Unit as a Measure of Syntactic Complexity in Emily Dickinson's Poems." Emily Dickinson Journal 11:1 (2002) 91-103. Hollander, John. Melodious Guile: Fictive Pattern in Poetic Language. New Haven: Yale University Press, 1988. The Holy Bible (King James Version). Salt Lake City, Utah: The Church of Jesus Christ of Latter-day Saints, 1988. Howard, William. "Emily Dickinson's Poetic Vocabulary." PMLA LXXII (March 1957): 225-48. Jamieson, Alexander. A Grammar of Rhetoric and Polite Literature. New York: Albert Mason, by Houghton, Osgood, & Co., no edition date given (ca. 1820-1842). Johnson, Samuel. A Dictionary of the English Language. London: W. Strahan, 1755. Kames, Henry Home, Lord. Elements of Criticism. New York: Connor & Cooke, 1836. Kempis, Thomas a. The Imitation of Christ (ca. 1418). London: C. Kegan Paul, 1881. Kent, George W. "Why Teach `Philology'?" ETC: A Review of General Semantics 32:2 (June 1975): 155-64. King, Stanley. "The Consecrated Eminence": The Story of the Campus and the Buildings of Amherst College. Amherst, Massachusetts: Amherst College, 1951. Kitzhaber, Albert Raymond. Rhetoric in American Colleges, 1850-1900. Dissertation: University of Washington, 1953. Kraitsir, Charles. Glossology: Being a Treatise on the Nature of Language and the Language of Nature. New York: George P. Putnam, 1852. Laird, Carlton. "Etymology, Anglo-Saxon, and Noah Webster." American Speech. 21:1 (Feb 1946) 3-15. Landau, Sidney I. Dictionaries: The Art and Craft of Lexicography. New York: Charles Scribner's Sons, 1984. Leavitt, Robert Keith. Noah's Ark, New England Yankees, and the Endless Quest. Springfield, Massachusetts: G & C Merriam, 1947. Le Duc, Thomas. Piety and Intellect at Amherst College 1865 -1912. New York: Columbia University Press, 1946. Leonard, James S. "Dickinson's Poems of Definition." Dickinson Studies 41 (Dec 1981): 18-25. Lewes, George Henry. The Principles of Success in Literature. Ed. Fred N. Scott. Boston: Allyn and Bacon, 1891. Lindberg-Seyersted, Brita. The Voice of the Poet: Aspects of Style in the Poetry of Emily Dickinson. Cambridge: Harvard University Press, 1968. Longsworth, Polly. Emily Dickinson: Her Letter to the World. New York: Thomas Y. Crowell, 1965. Lowenberg, Carlton. Emily Dickinson's Textbooks. Lafayette, CA: privately published, 1986. Lundin, Roger. Emily Dickinson and the Art of Belief. Grand Rapids, Michigan: William B. Eerdmans Publishing Company, 2004. McNeil, Helen. Emily Dickinson. London: Virago, 1986. Miller, Cristanne. Emily Dickinson: A Poet's Grammar. Cambridge: Harvard University Press, 1987. Miller, Ruth. The Poetry of Emily Dickinson. Middletown, Connecticut: Wesleyan University Press, 1968. Mudge, Jean McClure. Emily Dickinson and the Image of Home. Amherst: University of Massachusetts Press, 1975. Murray, K. M. Elizabeth. Caught in the Web of Words: James Murray and the Oxford English Dictionary. Oxford University Press, 1977. Newman, Samuel Phillips. A Practical System of Rhetoric, or the Principles and Rules of Style . . . . 10th ed. New York: Dayton and Newman, 1842. Oberhaus, Dorothy Huss. "Dickinson as Comic Poet." Approaches to Teaching Dickinson's Poetry. Ed. Robin Riley Fast and Christine Mack Gordon. New York: Modern Language Association, 1989. 118-23. _____“‘Tender Pioneer’: Dickinson's Poems on the Life of Christ." On Dickinson: The Best from "American Literature". Ed. Edwin H. Cady and Louis J. Budd. Durham and London: Duke University Press, 1990. 139-56. Ollendorf, H. G. Ollendorf's New Method of Learning to Read, Write, and Speak the German Language; to which is Added a Systematic Outline of German Grammar, by G. J. Adler . . . . New York: D. Appleton, 1846 (1845). O'Neill, Michael Thomas. Etymology: Its Meaning in Language Study Before 1900 and the English Tradition. Dissertation Abstracts International 37/10A, p. 6446, University of Florida, 1976. Oxford English Dictionary, online edition. Oxford University Press, 1990, 2007. Parker, Richard Green. Aids to English Composition. New York: Harper & Brothers, 1859. Patterson, Rebecca. The Riddle of Emily Dickinson. Cambridge: Houghton Mifflin, 1951. _____Emily Dickinson's Imagery. Amherst: University of Massachusetts Press, 1979. Payne, William Morton. English in American Universities. D. C. Heath: Boston, 1895. Porter, David. Dickinson: The Modern Idiom. Cambridge: Harvard University Press, 1981. Porter, Ebenezer. The Rhetorical Reader. New York: Mark H. Newman, 1846(?). Quackenbos, George P. First Lessons in Composition. New York: D. Appleton, 1851. _____Advanced Course of Composition and Rhetoric. D. Appleton: New York, 1866. Read, Allen Walker. "The Spread of Germanic Linguistic Learning in New England During the Lifetime of Noah Webster." American Speech 41 (1967): 163-81. Rollins, Richard M. The Long Journey of Noah Webster. University of Pennsylvania Press, 1980. Rollins, Richard M. ed. The Autobiographies of Noah Webster. University of South Carolina Press, 1989. Rosenbaum, S. P., ed. Concordance to the Poems of Emily Dickinson. Ithaca: Cornell University Press, 1964. Rosenblatt, Louise. The Reader, the Text, the Poem. London: Feffer & Simons, 1978. Rosenblatt, Paul. Class Lecture. Tucson: University of Arizona, Fall 1988. St. Armand, Barton Levi. Emily Dickinson and Her Culture: The Soul's Society. Cambridge: Cambridge University Press, 1984. Salska, Agnieska. Walt Whitman and Emily Dickinson: Poetry of the Central Consciousness. Philadelphia: University of Pennsylvania Press, 1985. Scudder, Horace E. American Men of Letters: Noah Webster. Boston: Houghton, Mifflin, 1881. Sewall, Richard. The Lyman Letters: New Light on Emily Dickinson and Her Family. Amherst: University of Massachusetts Press, 1965. _____The Life of Emily Dickinson. 2 vols. New York: Farrar, 1974. Shakespeare, William. The Riverside Shakespeare. Boston: Houghton Mifflin, 1974. Sherman, L. A. Analytics of Literature: A Manual for the Objective Study of English Prose and Poetry. Boston: Ginn, 1893. Sherwood, William R. Circumstance and Circumference: Stages in the Mind and Art of Emily Dickinson. New York: Columbia University Press, 1968. Shoemaker, Ervin C. Noah Webster: Pioneer of Learning. New York: AMS Press, 1966. Shurr, William H. The Marriage of Emily Dickinson: A Study of the Fascicles. Lexington: University Press of Kentucky, 1983. Small, Judy Jo. Positive as Sound: Emily Dickinson's Rhyme. Athens, Georgia: University of Georgia Press, 1990. Snyder, K. Alan. Defining Noah Webster: Mind and Morals in the Early Republic. New York: University Press of America, 1990. Spolsky, Ellen. "Computer-assisted Semantic Analysis of Poetry." Computer Studies 3, 3 (Oct 1970) 163-8. Taggard, Genevieve. The Life and Mind of Emily Dickinson. New York: Alfred A. Knopf, 1930. Tate, Allen. "Emily Dickinson." Emily Dickinson: A Collection of Critical Essays. Ed. Richard B. Sewall. Englewood Cliffs, New Jersey: Prentice-Hall, 1963. 16-27. Thackrey, Donald E. "The Communication of the Word." Emily Dickinson: A Collection of Critical Essays. Ed. Richard Sewall. Englewood Cliffs: Prentice, 1963. 51-69. Todd, Mabel Loomis. Ed. Letters of Emily Dickinson. New York: Harper & Brothers, 1931. Trench, Richard Chenevix. On the Study of Words 22nd ed. New York: Macmillan, 1892. Tyler, W. S. History of Amherst College During Its First Half Century 1821-1871. Springfield, Massachusetts: Clark W. Bryan, 1873. Uno, Hiroko. Emily Dickinson’s Marble Disc: A Poetics of Renunciation and Science. Kobe College, Japan: EIHŌSHA, 2002. Warfel, Henry R. Letters of Noah Webster. New York: Library Publishers, 1953. Watkins, Calvert, ed. The American Heritage Dictionary of Indo-European Roots. Boston: Houghton Mifflin, 1985. Webster, Noah. An American Dictionary of the English Language. 2 vols. Amherst, Massachusetts: J.S. & C. Adams Brothers, 1844. _____An American Dictionary of the English Language. 2 vols. New Haven, Webster, 1841. _____Dissertations on the English Language (1789). Gainesville, Florida: Scholars' Facsimiles & Reprints, 1951. _____An American Dictionary of the English Language (1828). San Francisco: Foundation for American Christian Education, 1967. Weisbuch, Robert. Emily Dickinson's Poetry. Chicago: University of Chicago Press, 1975. Wells, Henry W. Introduction to Emily Dickinson. Chicago: Packard, 1947. Wells, Ronald A. Dictionaries and the Authoritarian Tradition. Paris: Mouton, 1973. Whately, Richard. Elements of Rhetoric. Carbondale: Southern Illinois University Press, 1963. Whicher, George Frisbie. This Was a Poet: A Critical Biography of Emily Dickinson. Ann Arbor: University of Michigan Press, 1957. Woods, William F. "The Cultural Tradition of Nineteenth-Century ‘Traditional’ Grammar Teaching." ERIC Document 258267. Paper presented at the March 1985 Conference on College Composition and Communication. Worcester, Joseph E. Dictionary of the English Language. London: Sampson Low, Son & Co., 1859.